The sketch in Fig. 3-10 is typical of the work in this sketchbook. 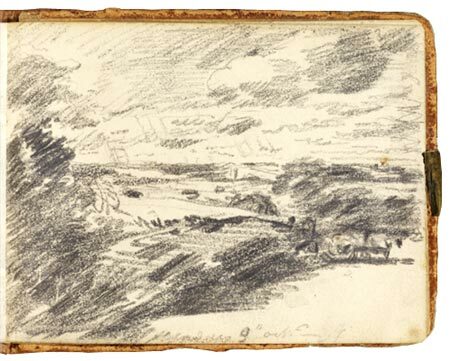 Much of Constable’s paintings went for big skies using this to set the theme, mood and to add drama and composition to his landscape paintings. 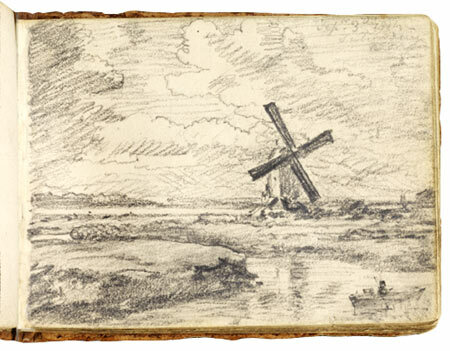 In the sketch he shows us a sky dominating the image as it takes up about 60% leaving the remaining 40% to feature – a windmill, river, boat and man as well as the flat landscape of the Norfolk Broads. 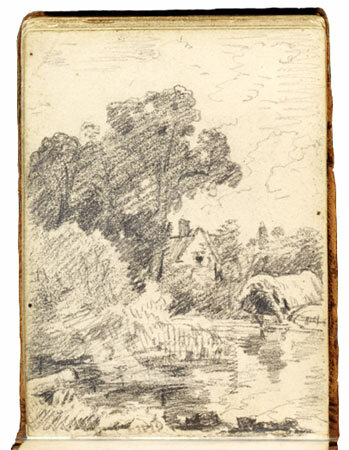 Constable quickly notes the tone of the scene using a lines and hatching adding weight to the shadow sides of objects to both anchor them and note the shadow. The composition is greatly aided by the device of the river starting from the bottom of the image and then snaking right and then left lifting the eye from the bottom of the scene up into the middle. Once the river is lost from view the eye continues along the banks and foliage lines to the windmill where the shaped clouds lift it in an arc across the sky and back down the left of the image, returning your eye to it’s starting point. 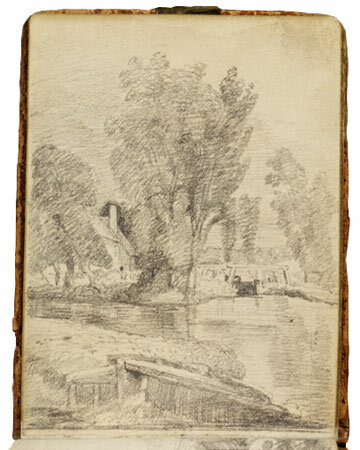 This maybe a simple sketch but Constable was a master of his craft and utilises his skills to craft sketch that is full of information from the scene as well as advising us of the weather and wind conditions. It is calm as there are no ripples on the surface of the water. 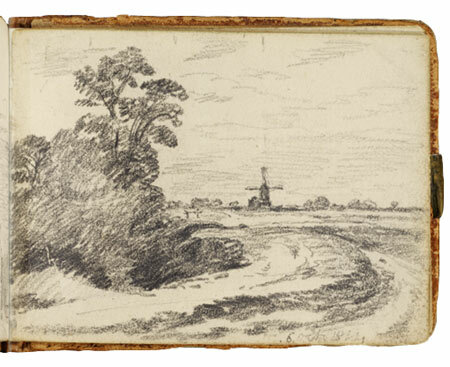 The tilt of the mill sails are echoed by the angle of the hatching lines that Constable uses through much of the drawing. The image is on white paper drawn probably using graphite. Fig. 3-1. shows us a corner of a simple country church yard. 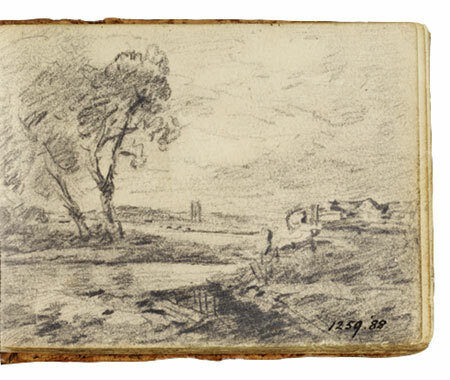 This simple scene is again filled with information that Constable would return to when painting his grand large paintings. The trees are in foliage indicating that we are here in either spring or summer-time. The day is bright with some cloud cover but the scene in front of us is partially lit by bright sunshine. This sunlight causes a strong shadow to fall across the roof of the church. The architecture details even for this corner of a simple country church are noted which lends conviction to this scene as well as providing a wealth of information he can ‘draw’ upon later. The far corner of the church is set against the deepest tone of the image. Having this deep tone set in the centre of the image acts as a pendulum for the light and medium tones which surround it. 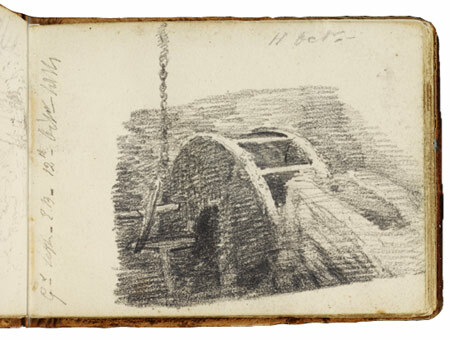 These simple sketches filled his sketchbooks and he used these to inform and compose his later studio work. Mulholland, R. (2018). 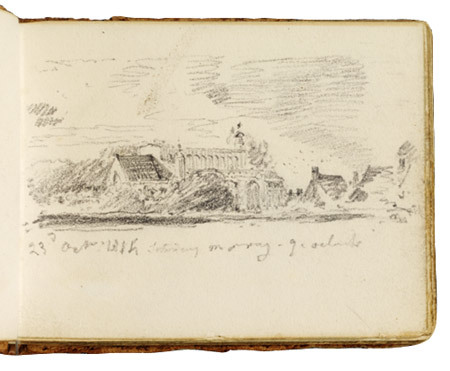 Constable sketches up close and personal. [online] Blog. 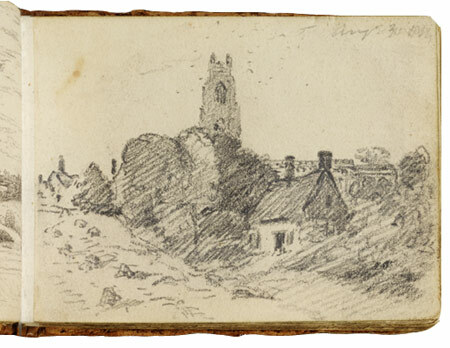 Available at: https://www.vam.ac.uk/blog/conservation-blog/constable-sketches-up-close-and-personal [Accessed 16 May 2018]. Tate, C. (2018). Constable at Tate – Illuminations. [online] Illuminations. Available at: https://www.illuminationsmedia.co.uk/product/constable-at-tate/ [Accessed 16 May 2018]. Tate. (2018). John Constable 1776-1837 | Tate. 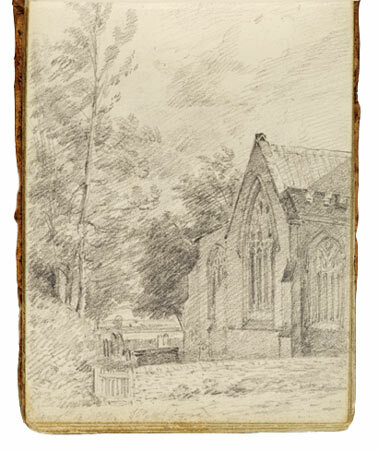 [online] Available at: https://www.tate.org.uk/art/artists/john-constable-108 [Accessed 16 May 2018]. Victoria and Albert Museum. (2018). 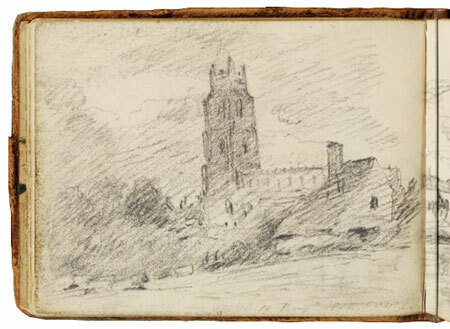 V&A · John Constable’s sketches. 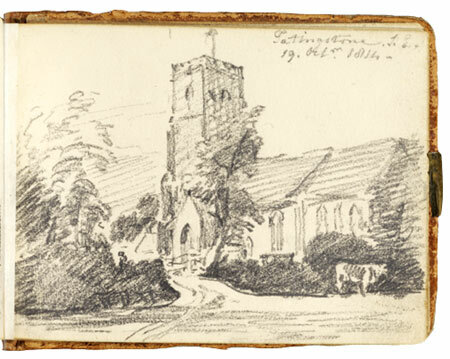 [online] Available at: https://www.vam.ac.uk/articles/john-constables-sketches [Accessed 16 May 2018].